Full-sur­face ad­hes­ive win­dow seal­ing tape from Pro Clima for ex­ter­i­or use with an ad­di­tion­al ad­hes­ive zone on the fleece side. The CON­TEGA SOLIDO EXO-D joint ad­hes­ive tape, which is full-sur­face ad­hes­ive and can be plastered over, en­sures windtight and dif­fu­sion-per­meable ex­ter­i­or seal­ing of win­dows and doors to ad­ja­cent build­ing com­pon­ents made of wood and min­er­al sub­sur­faces such as con­crete and ma­sonry. The in­teg­rated ad­hes­ive zone on the fleece side al­lows for easy ad­he­sion to win­dows and doors. Be­fore stick­ing, sub­sur­faces should be brushed off, wiped clean with a cloth or cleaned us­ing com­pressed air. Un­even min­er­al sub­sur­faces may need to be lev­elled with a smooth fin­ish. Ad­he­sion to frozen sur­faces is not pos­sible. There must be no wa­ter-re­pel­lent sub­stances (e.g. grease or sil­ic­one) on ma­ter­i­als to be bon­ded. Sub­sur­faces must be suf­fi­ciently dry and have suf­fi­cient load-bear­ing ca­pa­city. Per­man­ent ad­he­sion is achieved on all pro clima ex­ter­i­or mem­branes and on oth­er un­der­lay/sark­ing and wall lin­ing mem­branes (e.g. those made of PP and PET). Ad­he­sion can be car­ried out on planed and painted wood, hard plastics, hard wood-based pan­els (chip­board, OSB and ply­wood pan­els) and on min­er­al sub­sur­faces such as con­crete and ma­sonry. The best res­ults in terms of struc­tur­al sta­bil­ity are achieved on high-qual­ity sub­sur­faces. It is your re­spons­ib­il­ity to check the suit­ab­il­ity of the sub­sur­face; ad­he­sion tests are re­com­men­ded in cer­tain cases. Pre­treat­ment with TESCON PRIMER RP is re­com­men­ded in the case of sub­sur­faces with in­suf­fi­cient load-bear­ing ca­pa­city. Press firmly to secure the adhesive tapes, taking care to ensure that there is sufficient resistance pressure behind them. 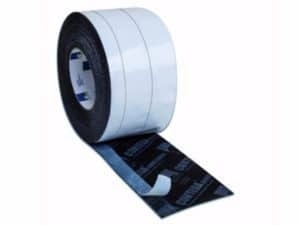 Driving rainproof and windtight seals can only be achieved if this connection tape is laid without folds or creases and are uninterrupted.